10:19: Jerami Grant draws a charge on Rudy Gay, and we’re tied at 11 at the first stoppage. Good for Grant, who couldn’t buy a call against Gordon Hayward in Utah the other night. Early on, both Grant and JaKarr Sampson (two of Brett Brown’s favorites) are supplying the Sixers with some energy. 10:23: Two dunks in a row for Noel on nice passes from Nik Stauskas and Ish Smith. Give the big fella six points before Jahlil Okafor replaces him. Okafor looks to be wearing a sleeve of some sort over that sore right knee that kept him out of the last two games. 10:41: And-one for Okafor out of the post, but I can’t help but notice it’s against Kosta Koufos. Anecdotally, it feels like Jah has eaten alive lesser big men (Koufos is serviceable, but guys like Dewayne Dedmon comes to mind) but struggled to generate quality looks against the Boogie’s of the NBA. That’s a bit concerning. 10:47: The puck is dropped, and man, the Shark Tank looks depressing on television. Sean Couturier, possibly having trouble adjusting to playing in the dark, goes to the box for hooking. good thing it looks like the flyers are playing in an abandoned warehouse. 10:52: Marco Belinelli is absolutely on fire coming off of pin-down screens and definitely worth giving up a couple of potential pick swaps as well as a first-round pick. Grant swats Boogie and Ish Smith finds Noel in transition for the dunk (12 points, 5-7 shooting). Like a hockey coach with his top defensive pairing, Brett Brown needs to make sure Smith is on the floor for all of Noel’s minutes. 11:00: And they’re off the power play. It wasn’t a good one, either. 11:08: Things are getting heated in in both games: You have Grant and Cousins in Sacramento as well as Radko Gudas and Joe Thornton in San Jose. The Sixers and Kings are all even at 57 at the end of the first half. 11:20: The snoozer of a first period ends scoreless. The Flyers are outplaying the Sharks at 5-on-5 at times, but they can’t hit the net on any of their shots: San Jose leads 9-3 in that department. In what has been a rarity over the past few months, the Sixers are winning the fun battle and it isn’t particularly close. 11:29: Back to the second half of hoops in California’s capital. A Grant triple and couple of Canaanballs have the Sixers up nine points as the Kings crowd boos loudly. Whatever you do, don’t lose to the Sixers, folks. Vivek Ranadive had seen enough. Late Wednesday night, as Sacramento Kings fans stormed out of Sleep Train Arena after a 110-105 loss to the lowly Philadelphia 76ers, the owner who has spent recent years picking all the wrong rebuilding paths was in the parking lot faster than you can say "DeMarcus Cousins trade." If his Kings history repeated itself on the roadways, there’s a good chance he got lost on his way home. 11:36: Smith has to be the fastest guard in the NBA. He just blew by Darren Collison (who also happens to be very fast) like he wasn’t even there. To finish that play, Smith throws a lob to Noel. The Kings are on a 10-2 run, and the Sixers are now only up 75-71. 11:40: Rajon Rondo inexplicably leaves Canaan to double Noel on an inbounds pass. Noel throws it right back to the inbounder for a Canaanball. Then, Noel (four steals) pokes the ball away from Boogie in the post to ignite a fast break. Noel’s hands are so unbelievably quick, and that is how he can combat Boogie’s massive strength advantage. Okafor checks into the game for Noel, so Brown is clearly staggering their minutes in this one. 11:48: We finally have a Richaun Holmes sighting, which is a bit unfortunate considering how well he played the other night in Utah. This five-man unit (Smith-Canaan-Stauskas-Holmes-Okafor) has been pretty stagnant. 11:51: Now Canaan and Stauskas are now missing wide-open threes. So much for Sauce's revenge game. Okafor sees Koufos again and his eyes light up. He draws the foul, makes one. Another strong move against Koufos two minutes later from Okafor, draws the foul and misses both. #sixers shooting 7-24 from three and 13-21 from the line. Amazing they still hold a 3 point lead. 11:52: Wait, Dainius Zubrus is still in the league? That Dainius Zubrus? That dude played with the Legion of Doom! 11:56: Thornton scores from point blank on the power play over Mason’s shoulder to make it 1-0 Sharks. Maybe Gudas should have found a way to take him to the penalty box again. 12:00: Happy New Year’s Eve. Robert Covington hits a trey to put the Sixers up five points, a good sign. He has been really struggling as of late. 12:10: And on the other channel, Okafor follows up a Stauskas miss to put the Sixers up five. Jah isn’t playing well, but I like how he is battling hard with Boogie on the block. For Okafor to unlock his full potential, I think he needs to be more physical (especially offensively). 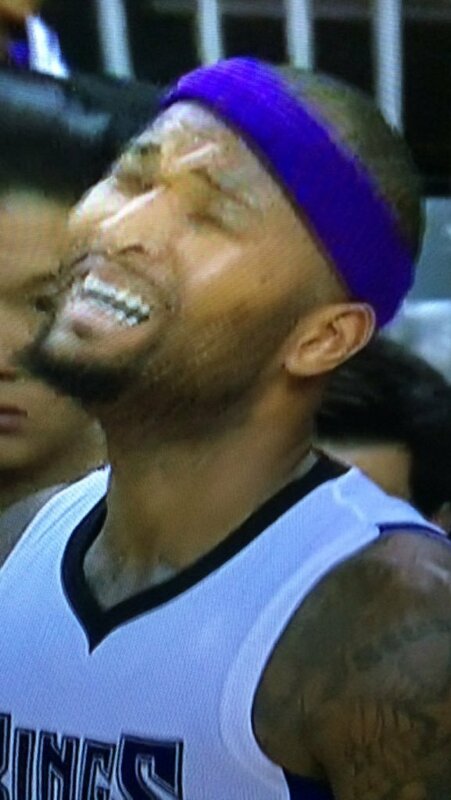 12:17: Boogie bravely takes a charge (good call) with four minutes left, which would have been his sixth foul. And a couple of possessions later, Smith lobs to Noel. Sixers by four. 12:21: Another charge drawn by Boogie, this time against Noel on a scrambled play. This one looked more suspect, though. 2:39 left, Sixers by two. 12:25: Smith wills the ball in, and then Noel outfights Boogie in the post on the defensive end… which results in Cousins fouling out. Ho boy. 12:33: Sixers win, 110-105. The pick-and-roll combination of Smith (18 and 9) and Noel (20 and 9) were unbelievable, as was Grant (18, 11, and 5). The Sixers are officially kind of fun to watch again. Long live Mike D’Antoni. Long live the pick swaps. 12:42: Back at the empty warehouse, Couturier scores on the breakaway and the Flyers have the lead. Might we just see two wins on the same night? 1:18: Nope, the Sharks add two more power-play goals and another one that occurred right after the man advantage ended for a 4-2 win. The Flyers were the better team at even strength tonight, but they got destroyed on special teams.